Police detective Tajima, tasked with tracking down stolen firearms, turns an underworld grudge into a blood-bath. Suzuki transforms a colorful pot-boiler into an on-target send-up of cultural colonialism and post-war greed. During the 1930s, a teenager yearns for a Catholic girl, whose only desire is to reform his sinful tendencies. Hormones raging, the young man channels his unsatisfied lust into the only outlet available: savage, crazed violence. A young hoodlum decides to work for a criminal organization that is tearing itself apart. A 1920s playwright meets a beautiful woman who may be the ghost of his patron's deceased wife. "Youth of the Beast" begins with what appears to be a double suicide--a cop and his mistress. However, this will play an important part in the film later. 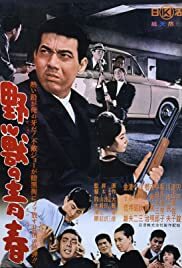 In the meantime, the ultra-cool Japanese actor, Jo Shishido, plays Jo Mizuno--a guy who is super-tough and wants to join one of the yakuza gangs. Hwever, he obviously has something up his sleeve, as he soon joins the rival gang--and soon he begins pitting them against each other. In many ways, this plays like a non-comedic version of Kurasawa's 1961 classic "Yojimbo"--as a crafty guy manages to gain the trust of both gangs in order to bring them down. The big question is why? Why does J constantly risk his life and what does this have to do with the two dead folks at the film's beginning? Because there are rival gangs and lots of betrayals, the film can get a bit confusing--especially at the end when everyone seems to be shooting everyone! These scum naturally don't wear uniforms so sometimes I did have a bit of trouble keeping track of who is who. Still, it is a very good gangster film--one that has plenty of action and the usual Shishido level of coolness. Well crafted and exciting--plus learning who was behind everything--that was a pretty fifty twist!